To celebrate its milestone 100th birthday, Overwaitea Food Group with the help of a local music teacher and students, broke a Guinness World Record. Teacher Teresa Harris and students from North Vancouver’s Seycove Secondary School help turn 1,100 bottles into musical instruments that played “Happy Birthday”. 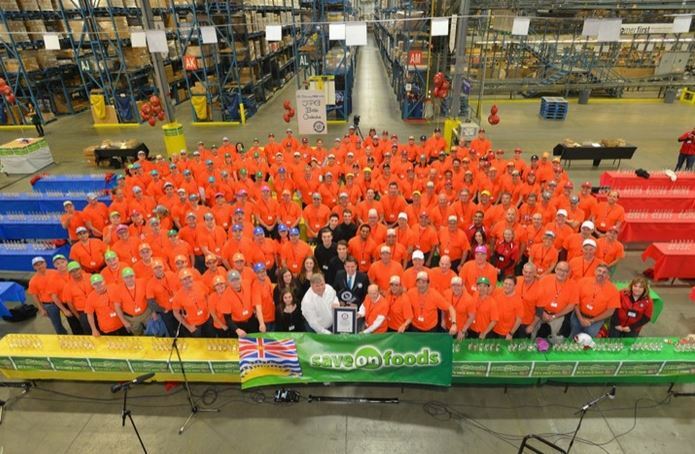 The previous record was 475 bottles and with the successful playing of 1100 bottles, Save-On-Foods and their friends are now the Guinness World Record holders of this title. The previous record was set in 2011 by Jack Daniels. The feat was completed on Friday in Langley by 172 newly-trained bottle musicians. Darrell Jones, the president of Save-On-Foods, said they could never have accomplished the feat without the help of the teacher and the Seycove Students. “(They) were so patient while teaching a bunch of business folks how to play music with bottles,” he said. “We’re a local company, celebrating our 100th birthday at a local event, but it sure feels great to be able to set a world record,” says Jones. All throughout B.C. and Alberta, Overwaitea Food Group has been bringing communities together with birthday party events, including an upcoming traveling roadshow to highlight their 100 years in business.